Safety supervisor requirements in Reliance Jamnagar Gujarat under contractor. Experience required- 2 to 3 years mechanical field such as pipeline , fabrication, structure erection . Salary range 15000 to 18000. Service charge applicable . To apply please refer following link. Experience Required: 7+ years in MEP Project mandatory. There are many things to consider while attempting the NEBOSH, but the main thing that the student should follow is the NEBOSH Command Words. These are the most important to achieve the NEBOSH IGC in the first attempt. Most of the students don’t follow the rules and some of them don’t know about that so the reason they get failed. These are the following NEBOSH command words. To give reference to an item, which could be its name or title. NB: normally a word or phrase will be sufficient, provided the reference is clear. To provide short, factual answers. To offer for consideration, acceptance, or use of another. NB: normally a single word, phrase or sentence will be sufficient. Give an example of; Give the meaning of. To indicate the principal features or different parts of. Collapse of the sides – Unsupported trench or incorrect angle of the sides. Water ingress –Through heavy rain or burst water main. Falling materials –Spoil dug from excavation or materials and tools stored at ground level could fall in. Underground services –Contact or rupturing of electricity, gas or water utilities. To give a detailed written account of the distinctive features of a subject. The account should be factual, without any attempt to explain. When describing a subject (or object) a test of sufficient detail would be that another person would be able to visualize what you are describing. An entanglement hazard would be associated with the rotating spindle that the abrasive wheel is mounted on. Drawing in and trapping is associated with the gap between the tool rest and the rotating abrasive wheel. Friction or abrasion hazards would be associated with the surface of the rotating abrasive wheel and stabbing or puncture hazards could be created by flying fragments or pieces of ejected broken wheel. To provide an understanding. To make an idea or relationship clear. NB: this command word is testing the candidate’s ability to know or understand why or how something happens. Is often associated with the words ‘how’ or ‘why’. Sensitive protective equipment is designed to identify the presence of a person or body part within the danger zone of machinery. Examples of such devices include pressure mats and light beams that are connected to the machine controls and would stop the machine rapidly should a person or body part be detected. It is important to read the whole question and to understand what the question requires as the command word on its own will need to be reinforced by the remainder of the question. Many candidates miss out on gaining marks because they do not read the question carefully enough and do not think about their answer thoroughly before writing it down. Candidates need to think about each question. what is the command word? how do I need to improve to gain marks? when it is or is not relevant to the question? In order to pass exam, a brief answer plan is an essential aid to ensuring that answers are well thought out and structured. NEBOSH applies a ‘positive marking’ approach; that is, marks are awarded for correct material in candidates’ answers, rather than being deducted for incorrect or missing material. Health and Safety at work – HSW – A perfect introduction to health and safety. This introductory qualification will help improve the safety culture in your organisation. By equipping your workforce to identify and deal with hazards at work. Hence it will help to reduce accidents and achieving cost savings for the business. The qualification being fulfilling the needs of an international audience. There is no content on UK law. The multiple choice assessment is currently available in English, Arabic, Mandarin, French, European Spanish and Russian. In order to achieve this qualification student need to attend 3 days course. 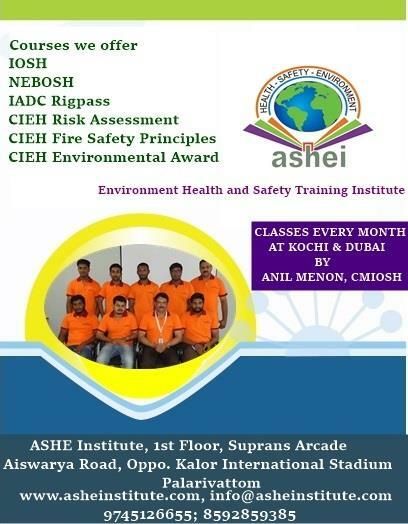 This course is an ideal first step towards other higher level NEBOSH qualifications including NEBOSH’s International General Certificate and National General Certificate. Also this qualification has been accredited and credit rated by the Scottish Qualifications Authority (SQA) and sits in the Scottish Credit and Qualifications Framework (SCQF). Command words are important to note while writing the examination. – To give reference to an item, which could be its name or title. – To provide short, factual answers. NB: normally a single word, phrase or sentence will be sufficient. – To indicate the principal features or different parts of. NB: an exhaustive description is not required. What is sought is a brief summary of the major aspects of whatever is stated in the question. – To give a detailed written account of the distinctive features of a subject. The account should be factual, without any attempt to explain. – To provide an understanding. To make an idea or relationship clear. • Firstly, What is the command word? •Furthermore, What do I need to say to gain marks? •Finally, What is or is not relevant to the question? In many cases a brief answer plan is an essential aid to ensuring that answers are well thought out and structured. In order to give further direction as to the detail of information required by the command word in a question, examples are given below both for general knowledge and for the IGC1 syllabus. Q1. Identify FOUR kitchen appliances. Q2. Identify FOUR types of bicycle. Note that giving only one or two word answers provides a clear reference and therefore is sufficient to satisfy an identify question. Identify FOUR hazards associated with excavations. Identify FOUR mechanical hazards associated with machinery. Identify FOUR types of safety sign. Again, answers are limited to a brief phrase or in some cases just two words but do give clear reference. To gain the marks for the outline example questions below, the same breadth of answer is required as for an identify answer, but now, additional information will be required to satisfy the depth of an outline. • Accommodates slices of bread, ejects as toast when ready. • 1 to 2 litre capacity, boils water. Can be cordless. Heats food rapidly using short wavelength radio waves. • Dirty tableware placed in baskets. Mixture of high pressure water and detergent automatically cleans. Outline FOUR types of bicycle. • Robust bicycle with deep tread tyres, suspension and several gear choices. • Lightweight frame with drop handlebars and maybe fixed gearing. • Vintage device with very large front wheel and small rear wheel. • Bicycle designed for two people with two seats and two sets of pedals. Outline FOUR hazards associated with excavations. • Unsupported trench or incorrect angle of the sides. • Through heavy rain or burst water main. • Spoil dug from excavation or materials and tools stored at ground level could fall in. • Contact or rupturing of electricity, gas or water utilities. Outline FOUR mechanical hazards associated with machinery. • Between counter rotation rollers, or pulley belts and wheels. • Contact with fast moving surfaces. • From ejected objects or flying objects. Outline FOUR types of safety sign. • Circular with red border, red diagonal bar and black symbol. Triangular, yellow background, black border and symbol. • Circular, blue background, white border and white symbol. • Rectangular, green background, white border and white symbol. Again, the identify answer (shown in bold) gives the breadth required and the additional information given in the bullet point satisfies the required depth for an outline. An oblong box shaped object, approximately 30cm tall, 30cm deep and 60cm long. There is a single hinged door at the front, typically see through. The door opens outwards and inside there is a space to place a plate or dish and a microwave transmitter is located above. Outside, on the front there will be normally two controls to set the power and cooking time. A manually propelled vintage bicycle consisting of a very large wheel at the front and a much smaller wheel at the back. The wheels are connected by a frame that supports a seat above the front wheel and handlebars to steer. Pedals are connected directly to the centre of the front wheel. Describe the mechanical hazards associated with abench grinder. In all of the describe answers above, no attempt is made to explain how a microwave cooker heats food, why the front wheel of a penny-farthing is so much larger than the rear wheel or how a person could be injured using an abrasive wheel. Explain how a microwave cooker heats up food. The frequency of microwaves used in a microwave cooker is sufficient to cause water molecules in food to vibrate. Vibrating molecules hit other water molecules and put them into the same vibration and therefore this vibration of molecules is converted into heat. Explain why there is a very large front wheel on a penny-farthing. By having a large front wheel, the peripheral (rim speed) of the wheel is much faster than the rotation of the pedals at the centre. This results in faster forward speed per pedal rotation. Also a larger wheel is more suitable for riding on cobbled streets or rough ground. Explain how sensitive protective equipment (trip device) can reduce the risk of contact with moving parts of machinery. Identify FOUR European cities AND give an example of a tourist attraction in EACH. Identify FOUR types of safety sign AND give an examplein EACH case. Ladder accidents usually are caused by improper selection, care or use, not by manufacturing defects. selection, good work procedures and adequate ladder maintenance. setting up and climbing ladders. Never use a damaged or unsafe ladder. Verify ladder capacity before climbing. and don’t use a step ladder as a straight ladder. Keep rolling ladders in good mechanical condition. Rolling ladders that are stored outside should be protected from rain, snow and ice. Rolling ladders that are stored outside should be inspected regularly for rust and corrosion. Inspect rolling ladders before use. Rolling ladders that have been damaged or “sprung” must be removed from service. Rolling ladders that have missing rubber “feet” should have them replaced. Rolling ladders should be climbed facing the ladder – not facing outward. Climb rolling ladders using 3-point contact – do not carry loads that are too bulky or heavy. Do not over reach – could cause ladder to tip. Do not stand on the hand rails. Do not move an occupied ladder. Never stand with one foot on the ladder and the other on an object such as shelving. Do not set up rolling ladders in areas where doors could swing open into the ladder. Avoid setting up rolling ladders in direct proximity to forklift or vehicle traffic. Do not tamper with or modify ladders. Remove tools, equipment or boxes before moving a rolling ladder. Use the step brake / lock if equipped. Consider tying off / securing the rolling ladder if tipping is a concern. Do not attempt to gain additional height by standing on boxes or buckets atop rolling ladder platforms. Submit ladder maintenance requests / safety concerns in writing. Hydrogen Sulfide(H2S) is a toxic, flammable, colorless, liquefied gas. Hydrogen Sulfide has a distinct “rotten-egg” smell. The odor cannot be relied on as an adequate warning of the presence of Hydrogen Sulfide because at high concentrations olfactory fatigue occurs. Inhalation of high concentrations of this gas can result in unconsciousness, coma, and death. Direct contact with liquid Hydrogen Sulfide can cause frostbite. Hydrogen Sulfide poses an immediate fire hazard when mixed with air. The gas is heavier than air, and may spread long distances. Distant ignition and flashback are possible. Flame or high temperature impinging on a localized area of a cylinder of Hydrogen Sulfide can cause the cylinder to explode without activating the cylinder’s relief devices. Provide adequate fire protection during emergency response situations. Contact with the liquid (or, contact with rapidly expanding gases) may cause frostbite. Inflammation and irritation of the eyes can occur at very low airborne concentration (less than 10 ppm). Exposure over several hours may result in “gas eyes” or “sore eyes” with symptoms of scratchiness, irritation, tearing and burning. Above 50 ppm, there is an intense tearing, blurring of vision, and pain when looking at light. Exposed individuals may see rings around bright lights. Most symptoms disappear when exposure ceases. However, in serious cases, the eye can be permanently damaged. In addition to irritation, contact of the eyes with the liquid can cause frostbite. Ingestion of Hydrogen Sulfide is not a likely route of industrial exposure. INHALATION: Inhalation of high concentrations of Hydrogen Sulfide can cause dizziness, headache, and nausea. Exposure to higher concentrations can result in respiratory arrest, coma, or unconsciousness. Exposure for more than 30 minutes at concentrations of greater than 600 ppm have been fatal. Continuous inhalation of low concentrations may cause olfactory fatigue, so that the odor is no longer an effective warning of the presence of Hydrogen Sulfide. Severe exposures which do not result in death may cause long-term symptoms such as memory loss, paralysis of facial muscles, or nerve tissue damage. The gas may be irritating to the skin. Direct contact with liquid or rapidly expanding gases (which are released under high pressure) may cause frostbite. Symptoms of frostbite include change in skin color to white or grayish-yellow. The pain after contact with liquid can quickly subside. TARGET ORGANS: Respiratory system, skin, central nervous system. SYMPTOMS: The most significant symptoms of chronic, low level exposure are related to the central nervous system, with potential nerve tissue damage. Repeated low level skin exposure may cause dermatitis. MEDICAL CONDITIONS AGGRAVATED BY OVEREXPOSURE: Acute or chronic respiratory conditions or eye disorders may be aggravated by over-exposure to Hydrogen Sulfide. CARCINOGENICITY: Hydrogen Sulfide is not found on the FEDERAL OSHA Z LIST, NTP, CAL/OSHA, or IARC Carcinogenicity lists. EYE CONTACT: If liquid is splashed into eyes, or if irritation of the eye develops after exposure to Hydrogen Sulfide, open victim’s eyes while under gentle, lukewarm, running water. Use sufficient force to open eyelids. Have victim “roll” eyes. Minimum flushing is for 15 minutes. Victim must seek immediate medical attention from an ophthalmologist. INGESTION: Ingestion is an unlikely route of exposure for Hydrogen Sulfide. INHALATION: Remove victim(s) to fresh air, as quickly as possible. Trained personnel should administer supplemental oxygen and/or cardio-pulmonary resuscitation, if necessary. SKIN CONTACT: If liquid is spilled on skin, or if irritation of the skin develops after exposure to liquid or gas, immediately begin decontamination with running water. Minimum flushing is for 15 minutes. Remove exposed or contaminated clothing, taking care not to contaminate eyes. Victim must seek immediate medical attention. In case of frostbite, place the frostbitten part in warm water. DO NOT USE HOT WATER. If warm water is not available, or is impractical to use, wrap the affected parts gently in blankets. Alternatively, if the fingers or hands are frostbitten, place the affected area in the armpit. Encourage victim to gently exercise the affected part while being warmed. Seek immediate medical attention. NOTES TO PHYSICIANS: Administer oxygen, if necessary and treat symptoms. Be observant for initial signs of pulmonary edema. Extinguish Hydrogen Sulfide fires by shutting-off the source of the gas. Use water spray to cool fire-exposed containers, structures, and equipment. Other appropriate extinguishing media are dry chemical, foam, and carbon dioxide. Evacuate all personnel from area. If possible without risk, shut off source of gas, then fight fire according to types of materials burning. Extinguish fire only if gas flow can be stopped. This will avoid possible accumulation and re-ignition of a flammable gas mixture. Keep adjacent cylinders cool by spraying with large amounts of water until the fire burns itself out. For small releases, if it is not possible to stop the leak, and it does not endanger personnel, let the fire burn itself out. Incipient fire res-ponders should wear eye protection. Structural fire fighters must wear Self-Contained Breathing Apparatus and full protective equipment, including fire resistant clothing. Large fires should be fought from a distance with an unmanned hose holder or monitor nozzles. If this product is involved in a fire, fire run-off water should be contained to prevent possible environmental damage. If necessary, decontaminate fire-response equipment with soap and water solution. Most cylinders are designed to vent contents when exposed to elevated temperatures. Pressure in a cylinder can build-up due to heat and it may rupture if pressure relief devices should fail to function. An extreme explosion hazard exists in areas in which the gas has been released but the material has not yet ignited. Evacuate immediate area. Eliminate any possible sources of ignition, and provide maximum explosion-proof ventilation. Shut off source of leak, if possible. Isolate any leaking cylinder. If leak is from container, pressure relief device or its valve, contact your supplier. If leak is in user’s system, close cylinder valve, safely vent pressure and purge with inert gas before attempting repairs. Protection of all personnel and the area must be maintained. All res-ponders must be adequately protected from exposure. Monitoring should be done for the levels of Hydrogen Sulfide. Colorimetric tubes are available to detect the presence of Hydrogen Sulfide. Levels of Hydrogen Sulfide should be below levels listed in Section 2 (Composition / Information on Ingredients) and the atmosphere must have at least 19.5% oxygen before personnel can be allowed in the area without Self-contained breathing apparatus. Combustible vapor levels must be below 0.4%, which is 10% of the LEL of Hydrogen Sulfide, prior to entry. STORAGE: Store cylinders in a well-ventilated, secure area, protected from the weather. Cylinders should be stored up-right with valve outlet seals and valve protection caps in place. Storage should be away from heavily traveled areas and emergency exits. There should be no sources of ignition. All electrical equipment should be explosion-proof in the storage areas. Storage areas must meet National Electrical Codes for Class 1 hazardous areas. Flammable storage areas should be separated from oxygen and other oxidizers by a minimum distance of 20 ft. or by a barrier of non-combustible material at least 5 ft. high, having a fire resistance rating of at least 1/2 hour. Post “No Smoking or Open Flames” signs in the storage and use areas. Do not allow storage temperature to exceed 125 °F (52 °C). Full and empty cylinders should be segregated. Use a first-in, first-out inventory system to prevent full containers from being stored for long periods of time. Consideration should be taken to install leak detection and alarm equipment for storage areas. HANDLING: Do not drag, roll, slide or drop cylinder. Use a suitable hand truck designed for cylinder movement. Never attempt to lift a cylinder by its cap. Secure cylinders at all times while in use. Use a pressure reducing regulator to safely discharge product from cylinder. Use a check valve to prevent reverse flow into cylinder. Never apply flame or localized heat directly to any part of the cylinder. Once cylinder has been connected to properly purged and inerted process, open cylinder valve slowly and carefully. If user experiences any difficulty operating cylinder valve, discontinue use and contact supplier. Never insert an object (e.g., wrench, screwdriver, etc.) into valve cap openings. Doing so may damage valve, causing a leak to occur. Use an adjustable strap-wrench to remove over-tight or rusted caps. All piped systems and associated equipment must be grounded. Electrical equipment should be non-sparking or explosion-proof. Always store and handle compressed gas cylinders in accordance with Compressed Gas Association, Inc. (telephone 703-412-0900) pamphlet CGA P-1, Safe Handling of Compressed Gases in Containers. Local regulations may require specific equipment for storage and use. VENTILATION: Hydrogen Sulfide detectors should be installed in or near areas where Hydrogen Sulfide is being used or stored. If appropriate, install automatic monitoring equipment to detect the level of oxygen and the presence of potentially explosive air-gas mixtures. Because of the high hazard associated with Hydrogen Sulfide, stringent control measures such as a gas cabinet enclosure or isolation may be necessary. Provide natural or explosion-proof ventilation adequate to ensure Hydrogen Sulfide does not reach exposure limits listed in Section 2. (Composition / Information on Ingredients). Local exhaust ventilation is preferred, because it prevents gas dispersion into the work place by eliminating it at its source. Maintain exposure levels of Hydrogen Sulfide below the levels listed in Section 2 (Composition / Information on Ingredients). Use supplied air respiratory protection if Hydrogen Sulfide levels exceed exposure limits or during emergency response to a release of this product. If respiratory protection is required, follow the requirements of the Federal OSHA Respiratory Protection Standard (29 CFR 1910.134), or equivalent State standards. The following NIOSH respiratory protection recommendations are for Hydrogen Sulfide. Up to 100 ppm – Powered air purifying respirator with cartridge(s) to protect against hydrogen sulfide; or gas mask with canister to protect against hydrogen sulfide; or SAR; or full-face piece SCBA. Emergency Use: Emergency or Planned Entry into Unknown Concentration or IDLH Conditions: Positive pressure, full-face piece SCBA; or positive pressure, full-face piece SAR with an auxiliary positive pressure SCBA. Gas mask with canister to protect against hydrogen sulfide; or escape-type SCBA. The IDLH concentration for Hydrogen Sulfide is 100 ppm. High concentrations may be within the flammable range and must not be entered. EYE PROTECTION: Safety glasses. Additionally, face-shields should be worn if there is a potential for contact with liquid Hydrogen Sulfide. Eye wash stations/safety showers should be near areas where Hydrogen Sulfide is used or stored. SKIN PROTECTION: Work gloves are recommended when handling cylinders of Hydrogen Sulfide. Use thermally insulated gloves when working with containers of Liquid Hydrogen Sulfide. Wear chemically-resistant gloves when using this gas. Butyl rubber, chlorinated polyethylene, neoprene nitrile, and polyvinyl rubber are recommended. Use fire-resistant gloves and clothing in emergency situations. Use double gloves for spill response. OTHER PROTECTIVE EQUIPMENT: Use body protection appropriate for task. Static-resistant clothing is recommended. Safety shoes are recommended when handling cylinders. Transfer of large quantities under pressure may require use of fire retardant and/or chemically impervious clothing. APPEARANCE, ODOR AND STATE: Colorless gas. The liquid is also colorless. The odor for both the liquid and gas is similar to that of “rotten eggs”. CHEMICAL STABILITY: Stable CONDITIONS TO AVOID: Cylinders should not be exposed to temperatures in excess of 125 °F (52 °C). INCOMPATIBILITY (Materials to Avoid): Hydrogen Sulfide is a strong reducing agent and is highly reactive. Hydrogen Sulfide is not compatible with the following materials: oxidizing agents, organic peroxides, alkaline materials, metals (i.e. copper, lead), and metal oxides. Hydrogen Sulfide is corrosive to most metals, because it reacts with these substances to form metal sulfides. Assembly Area Safety Rules. The company expects workers to follow its safety rules. By signing, you will be held responsible for following these safety rules. Disciplinary action could result when these safety rules are not followed. These safety rules are for your safety only. Please use these safety rules on the job site to keep yourself and others safe. •Employees must wear their seat belts when driving on company business. •Report to work free from the aftereffects of drugs or alcohol. •Report maintenance needs or hazards before the end of your work shift. •Report incidents or injuries before the end of your work shift. •Do not climb on racking or shelving. •Keep emergency eyewash stations clear. •Keep fire exits clear, unblocked and unlocked. •Fire exit and emergency lighting should be lit and battery backups should function. •Keep fire extinguishers and fire alarm pull stations clear. •Do not bypass safety devices on hand or power tools. •Wear eye protection to protect your eyes from flying objects. •Wear hearing protection when exposed to loud machines or noise. •Clean up spills of liquid and water. •Straighten floor runners or rugs that could trip fellow employees. •Keep desk chairs and desk drawers pushed in when not in use. •Know severe weather shelter locations within the building. •To reach items use a proper foot stool or ladder and never stand on chairs or desks. •Get help to team lift heavy objects like supplies, components or tools. •Operate forklifts only if you are trained and authorized. •Wear your seat belt when operating forklifts. •Report security concerns, door locks or security system components that don’t function. •Wear proper footwear on the job and during winter weather. •Scan for trip hazards in the parking lot. sources of amputations in the workplace?Amputations are some of the most serious and debilitating workplace injuries. They are widespread and involve a variety of activities and equipment. Amputations occur most often when workers operate unguarded or inadequately safeguarded mechanical power presses, power press brakes, powered and non-powered conveyors, printing presses, roll-forming and roll bending machines, food slicers, meat grinders, meat-cutting band saws, drill presses, and milling machines as well as shears, grinders, and slitters. These injuries also happen during materials handling activities and when using forklifts and doors as well as trash compactors and powered and non-powered hand tools. Besides normal operation, the following activities involving stationary machines also expose workers to potential amputation hazards: settingup, threading, preparing, adjusting, cleaning, lubricating, and maintaining machines as well as clearing jams. What types of machine components are hazardous? Point of operation—the area of a machine where it performs work on material. Power-transmission apparatuses—flywheels, pulleys, belts, chains, couplings, spindles, cams, and gears in addition to connecting rods and other machine components that transmit energy. Other moving parts—machine components that move during machine operation such as reciprocating, rotating, and transverse moving parts as well as auxiliary machine parts. What kinds of mechanical motion are hazardous? Rotating—circular movement of couplings, cams, clutches, flywheels, and spindles as well as shaft ends and rotating collars that may grip clothing or otherwise force a body part into a dangerous location. Reciprocating—back-and-forth or up-and down action that may strike or entrap a worker between a moving part and a fixed object. Transversing—movement in a straight, continuous line that may strike or catch a worker in a pinch or shear point created between the moving part and a fixed object. Cutting—action generated during sawing, boring, drilling, milling, slicing, and slitting. Punching—motion resulting when a machine moves a slide (ram) to stamp or blank metal or other material. Shearing—movement of a powered slide or knife during metal trimming or shearing. Bending—action occurring when power is applied to a slide to draw or form metal or other materials. What can employers do to help protect workers from amputations? Guards provide physical barriers that prevent access to hazardous areas. They should be secure and strong, and workers should not be able to bypass, remove, or tamper with them. Guards should not obstruct the operator’s view or prevent employees from working. Devices help prevent contact with points of operation and may replace or supplement guards. Devices can interrupt the normal cycle of the machine when the operator’s hands are at the point of operation, prevent the operator from reaching into the point of operation, or withdraw the operator’s hands if they approach the point of operation when the machine cycles. They must allow safe lubrication and maintenance and not create hazards or interfere with normal machine operation. In addition, they should be secure, tamperresistant, and durable. You are responsible for safeguarding machines and should consider this need when purchasing machinery. New machinery is usually available with safeguards installed by the manufacturer. You can also purchase appropriate safeguards separately or build them in-house. Are certain jobs particularly hazardous for some employees? Yes. Under the Fair Labor Standards Act, the Secretary of Labor has designated certain nonfarm jobs as especially hazardous for employees under the age of 18. These workers generally are prohibited from operating band saws, circular saws, guillotine shears, punching and shearing machines, meatpacking or meat-processing machines, paper products machines, woodworking machines, metal-forming machines, and meat slicers.